Stovepipe should be installed through a wall instead of the ceiling in two-story homes that have a wood stove on the first floor. The alternative--running the pipe through an upstairs room--is not as safe and is more expensive. Properly installed stovepipe and a properly engineered chimney piece to pass through the wall will provide adequate draw and ventilation for most wood stoves. Stovepipe installation is easier when a wood stove is placed near a wall. Run standard single-walled stovepipe from your wood stove to the point in the wall through which the chimney piece will be installed. Single-walled stovepipe will allow some of the heat that normally escapes up the chimney to enter the room as radiant heat. The part of the stovepipe that passes through the wall is critical for safety. The specifications will vary depending on your local building codes. 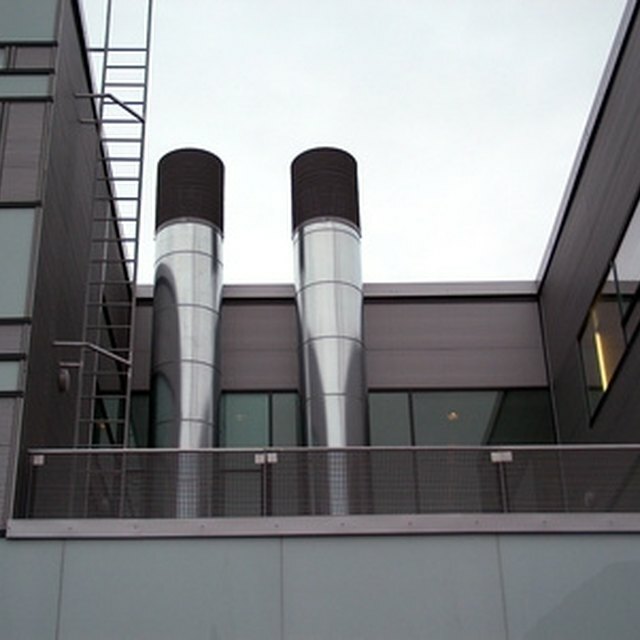 Some codes require a minimum of a double-walled Class A chimney pieces for a wall pass-through, while other codes may require triple-walled Class A pipe. Connect the single-walled pipe from the stove to this chimney piece. Install stovepipe on the exterior wall of the house. Secure the pipe to the side of the house with metal brackets that keep the pipe a safe distance from the siding and other potentially flammable materials. The distance will be defined by local building codes. Install enough stovepipe so the top of the pipe is at least 12 inches above the highest point on the roof. The longer the stovepipe, the better the draw and efficiency of the stove.